Just a quick update on some of the goings on during the week. A house owned by Cincinnati up-and-coming wide receiver Jerome Simpson had pounds of marijuana delivered to it. Tisk, tisk Jerome. Just after everyone used their waiver positions to pick you up, you go and do this? Not good news for you or your football career. Speaking of the Bengals, fellow teammate Cedric Benson is filing an appeal of a 3 game suspension from the league for violations of the leagues conduct policy. Since he is appealing, he may not miss time but I’m thinking the suspension goes through. Too bad for him since his schedule looks so favorable after this week. Oh yeah, Bernard Scott looks like a good sleeper pick up if you have a spot on the bench for him. Patrick Chung is OUT for the Patriots. Only pertain-able to those that play IDP (Individual Defensive Players), and for those that have the Patriots defense. He is a difference maker for sure. The secondary will miss him for however many games he is out. Going up against a good-looking Bills offense and being on the road, I’m betting the Patriots end week 3 still with the highest yards allowed total in the NFL. Romo still has not practiced as of Friday, keep an eye on that. If Romo can’t go, Kitna isn’t a terrible option. Especially if Bryant comes back to play. He and Kitna had a nice connection last year. Vick is practicing and looks to be on track to play versus the Giants. Sidney Rice has practiced fully this week! If you are looking for some huge upside, this is the best bet you have. Looked like a sure number one receiver two years ago, he hasn’t been fully healthy in quite some time. Sure he doesn’t have Brett Favre chucking the deep ball anymore but Tarvaris is sure to throw to his best weapon… right? 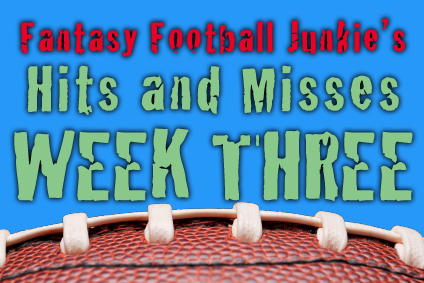 Ok, enough delaying, onto the recap of last weeks Hits and Misses. Another crappy day from yours truly but not all is lost. Two of them actually panned out. Brandon Jacobs had a nice game and finished 17th and David Nelson was instrumental in the win over Oakland finishing tied for 14th. That was the good, now for the bad. I missed on four including Rex Grossman (who wasn’t terrible), Lance Kendricks (I’m done with him… maybe), and the Denver Defense (what was I thinking). Now for this weeks nominees! I really like Matt this week. The Denver defense hasn’t been spectacular and they are probably without one of their best players, Champ Bailey. The Bronco’s are slated to get back DJ Williams this week which will help them shutdown the run game, but still leaves plenty of room to throw over the top. I really had a hard time finding a decent RB to put here. I normally am not an Addai fan but he didn’t look terrible last week and the Steelers are sure to make this game a blowout which should mean more work for Addai. I just have a feeling he makes a decent game of it this week. Of course, he could also get hit early and be out of the game… what am I, a fortune-teller? Like I just stated two spots above. 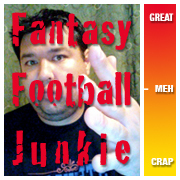 I like Hasselbeck this week, which also means, I like his receivers as well. He is targeting both Britt and Nate a ton and I don’t expect things to change. Dickson’s numbers haven’t been great but Flacco was terrible last week against the Titans. Dickson was second on the team in targets though which means they are trying to feature him more. Look for the Ravens entire team to bounce back this week. Hopefully Dickson nets a decent game. First home game of the regular season and the offense is in shambles. Looks like it’s up to Rob Ryan’s defense to step up its game. With the newly energized Redskins coming to town it won’t be easy but the defense will have it’s opportunities against gun-slinger Rex Grossman. If they take one to the house, this pick looks like genius. I really struggled picking them this week. I just want to crack .500 at least! Look for the Sunday Lightning player on Sunday morning!